E.T. Gets his Guns Back! Anyone for whom the 1982 film “E.T. the Extra-Terrestrial” is a treasured childhood memory will have shared my rage when, back in 2002, Steven Spielberg and his producer Kathleen Kennedy digitally disarmed the cops pursuing the cute alien and his human pal, replacing their firearms with walkie-talkies. At the time, Ms Kennedy had worked hard to placate fans, explaining that Spielberg had always regretted the presence of weapons in the film and had thought it nonsensical that police would have tooled up to go chasing children (um, children and an alien, and this is America, but hey, who am I to stereotype?). This edit, one of many made for the theatrical re-release of the movie to mark its 20th anniversary, has been lambasted and quite shamelessly parodied since, particularly by the satirical geniuses behind South Park (the “Free Hat” episode). And there’s a good reason for the reaction: swapping out guns for walkie-talkies was a damn silly thing to do, and quite frankly smacked of an aging man getting embarrassingly jiggy with new technology in an attempt to reconnect wiv da kidz. Well, it would seem that over the next nine years Mr Spielberg had a change of heart, and by 2011 had admitted that he regretted this “pointless” alteration of what is arguably his greatest film ever. (Seems Spielberg has a lot of regrets – I hope the Kingdom of the Crystal Skull is one of them.) 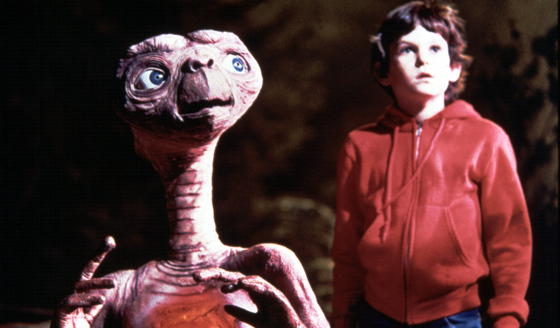 I’m sure that fans and geeks everywhere will be ecstatic to hear that, in the 30th anniversary Blu-ray edition of ET, which will be released in Autumn 2012, the walkie-talkies are out and the guns are back in. Hell, I’m happy enough, and I don’t even have a Blu-ray player. I can understand that directors, like many artists, are rarely wholly satisfied with their finished product and are often itching to tinker with it – take Picasso, for example, who would keep paintings back, sometimes for years, in order to continue adding to them – or Leonardo da Vinci, who reputedly said that art is never finished, only abandoned. But when your work has had such a positive effect on so many people, shouldn’t you just be content? With that level of impact, is it even really “yours” to tinker with anymore? Or do you make like Mr Lucas and insist that “my movie, with my name on it, that says I did it, needs to be the way I want it”? There are those who say that art is inherently selfish, but when you sell your art to others, it kinda becomes theirs.